Every year, my friends and I go to the Oktoberfest in Addison, Texas. Addison is a suburb north of Dallas that contains a gazillion bars and restaurants. Addison Oktoberfest is big, taking up almost nine acres and attracting almost 70,000 people each year. Even though it’s just a few miles away from Dallas, we like to book a couple of hotel rooms so we can drink and enjoy ourselves without worrying about how we’re going to get home. There’s a lot to see and do, so it’s nice to make a night out of it. Unfortunately, Addison Oktoberfest is sometimes a victim of its own popularity. The lines can be long, and they don’t always have the beer you want, especially if you’re a fan of Franziskaner Hefeweizen. 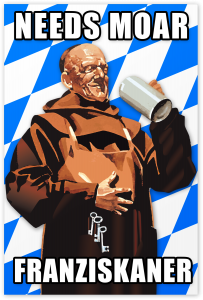 Even though it’s a beer celebration, the Addison Oktoberfest only has three beers, Spaten Oktoberfest beer, Spaten Pilsner and a hefeweizen called Franziskaner. The Franziskaner is the best of the three, but it’s also the rarest. It’s often gone before sunset. After that, we switch to the Oktoberfest beer, and if that runs out, the Pilsner. Oktoberfest is my favorite ethnic-themed drinking holiday. I like it more than St. Patrick’s Day or Cinco de Mayo. Maybe it’s because I’m mostly German, or maybe it’s because I like beer. In any case, I always look forward to drinking at Addison Oktoberfest.